Curiosity’s first hole in over a year. That’s one small hole for a probe, but one giant leap for NASA. 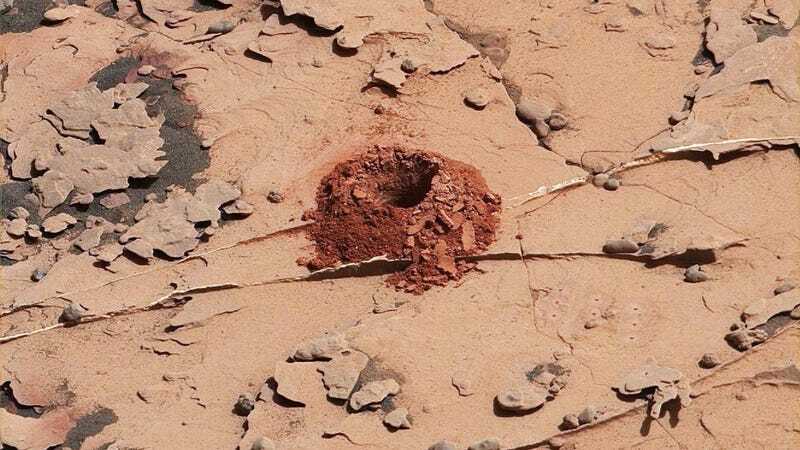 This past weekend, the space agency jerry-rigged Curiosity’s malfunctioning drill, allowing the rover to bore into Martian rock for the first time in over a year. Curiosity’s drill has been giving NASA fits for quite some time now. Electrical issues caused problems with the hammering mechanism early on, but things took a turn for the worse when the rover’s drill feed broke down in December 2016, preventing the drill from moving up and down. Curiosity’s drill, in order to bore into rock and collect dust samples, must be lowered down onto a rock, at which time the combined motion of the rotating drill bit and a percussive action does the work. Unable to move the drill along the vertical axis, NASA’s rover was severely hampered, and unable to perform fundamental aspects of its mission. 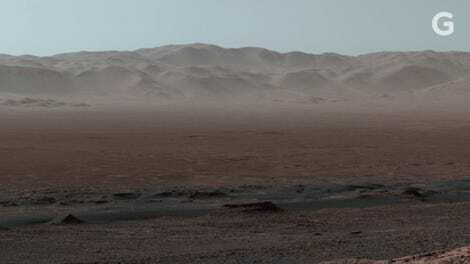 But Curiosity is now back to drilling, thanks to a neat idea conjured by mission engineers. Essentially, the rover now uses its extended arm to drill in a freestyle manner, and without the benefit of two stabilizers. Back in February, NASA proved that Curiosity could lower the drill onto a rock and spin the drill bit, but it hadn’t tried the necessary percussive motion, which turns the drill into a veritable jackhammer. Yep, that’s a hole all right. During the May 20th test on a rock called Duluth, the rover put it all together, proving that its drilling functionality could be restored. The rover managed to drill a hole measuring two inches deep, and about 0.6 inches wide. The percussive technique works, but there’s still more work to do. From here, the engineers have to refine the process whereby the rover delivers the dusty rock samples to its two internal chemical laboratories for analysis. For the next phase of this project, NASA engineers will use the rover’s cameras to estimate how much dust trickles out from the drill’s interior when it moves backwards. The drill’s percussive motion can also tap out the powder. Assuming this works, and that the scientists have a clear idea as to the quantity of dust that can be delivered to Curiosity’s testing area, they’ll eventually be able to deliver the dust to the lab and restore the rover’s ability to analyze Martian samples. This next test is scheduled for this coming Friday.